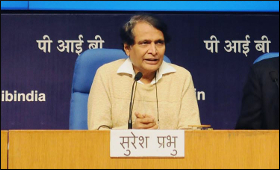 Union Minister of Commerce and Industry Suresh Prabhu Tuesday said that India is one among the first countries in the world to support the need for Intellectual Property Rights(IPR) especially in the pharmaceutical sector. Inaugurating a 2 days National Conference on Counterfeiting and Role of Enforcement Agencies in New Delhi, Suresh Prabhu said India is fully committed to have Intellectual Property Rights in the country and towards that end the Government of India enacted the National IPR Policy 2016(NIPR Policy). This will stimulate innovation and creativity across sectors and will also provide a clear vision regarding IPR issues, he added. The Minister further elaborated the various initiatives of the Government and the Department of Industrial Policy and Promotion(DIPP) under the Ministry of Commerce and Industry like awareness initiatives for citizens and business houses, strengthening of enforcement agencies, sensitization of the judiciary, simplifying and streamlining of processes for applying for patents and trademarks. Speaking at the event, Tomasz Kozlowski, Ambassador of the European Union to India and Bhutan, said that protection and enforcement of IPRs is crucial to creativity and innovation. In the European Union, IPR incentive sectors account for 40% of the GDP. European Union countries are some of the most innovative countries in the world. Counterfeit and pirated goods account for 2.5 % of global trade. It is in India’s interest to protect IPRs and to have more effective law enforcement, he said.